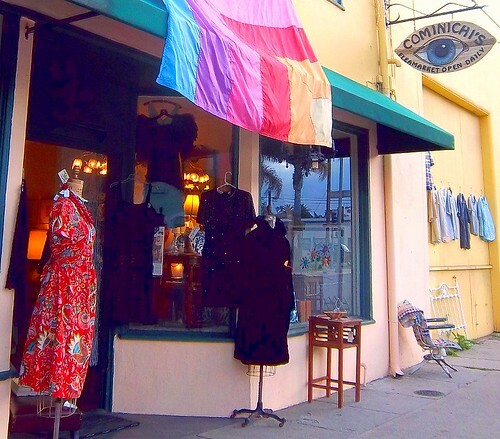 Cominichi's is one of Santa Barbara's favorite purveyors of vintage fabulousness. 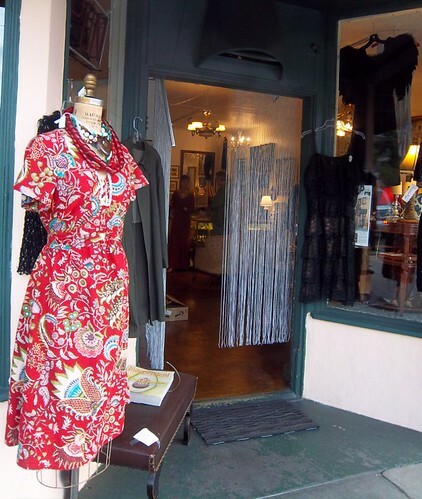 Owner, Gina Comin, has gathered a unique group of antiques dealers, each of whom has composed an enticing exhibit of vintage collectibles for sale; together, they comprise the Cominichi's experience. Many eras are represented here. 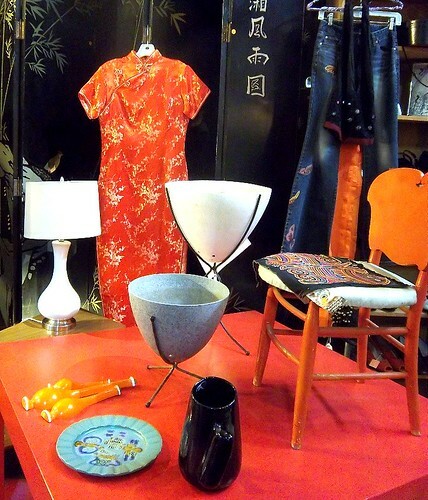 Whether you have a taste for 19th century dinnerware, 70s era disco shoes, or mid-century home furnishings, Cominichi's can accommodate almost any vintage predilection. New items are continuously added to the colorful display. Cominichi's vendors perpetually comb Southern California for great vintage finds; they are passionate curators who uncover the uniquely beautiful, the slightly tattered, the gently aged - all manner of one-of-a-kind antiques and collectibles. Stop by Cominichi's to search for a specific item - or just to browse. 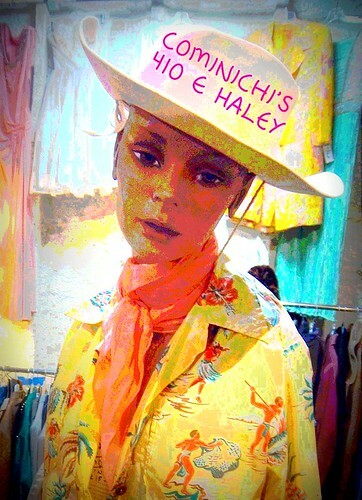 Try on the rhinestone bracelets, the ethnic necklaces, the mid-century California cowboy shirts with snaps on the pockets. Find your new favorite vintage Hawaiian shirt for the summer. Leaf through the vintage books. 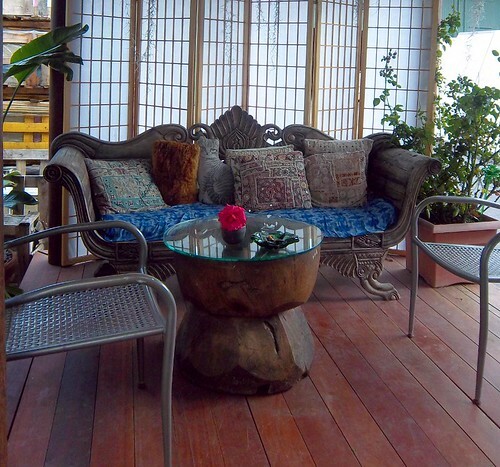 Step out to the patio and have a seat on the dramatic divan. Visit often, get to know Gina and the staff. Enjoy the constantly changing panorama of beautiful vintage wares. 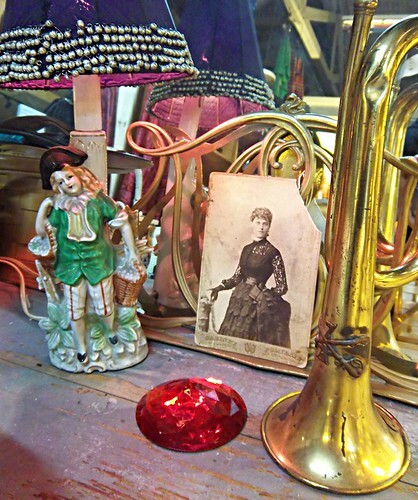 Discuss your favorite collectibles or antiques with people who share your fascination with all things vintage. If you are a collector in search of a space to sell your wares, call Gina and chat with her about renting a space - large or small. Cominichi's is also accepting vintage furniture on consignment. Cominichi's is now located at 410 E Haley Street. There is plenty of street parking in front of the store. If you have any questions, call them at 805 962 1413. Visit an earlier post I wrote about Cominichi's at Mom's. At the end of the post, I have included Gina's recollections about Mom's, the building that was the home of Cominichi's for years before demolition was scheduled. 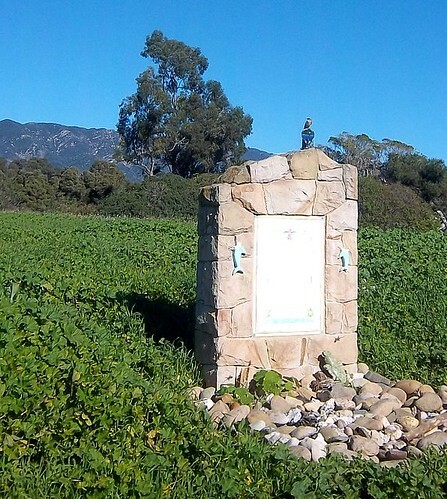 Gina also shares some of her childhood memories of the Santa Barbara Italian community, as well as a brief history Mom's Italian Restaurant. Be sure to check the Cominichi's website often for updates about special events and new items on display. The Surfrider Foundation is an organization made up of more than 50,000 members, worldwide, who work together to ensure our oceans are kept safe, clean, and accessible. 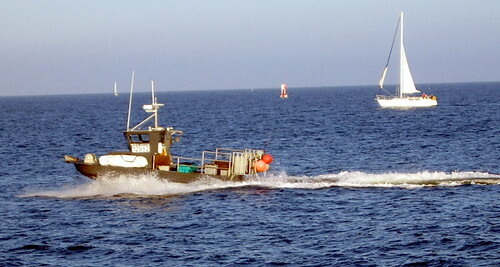 They do so through public education, community events, and by adopting special projects throughout America's coastal areas - and internationally, as well. 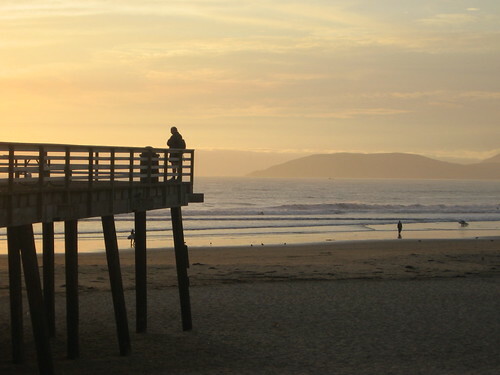 Visit their website at Surfrider Foundation to learn more about their current projects (including an effort to save our local Gaviota coast), how to particpate in beach clean-up and other volunteer activities, and what is being done to ensure permanent, easy, public access to beaches and unique coastal environments. 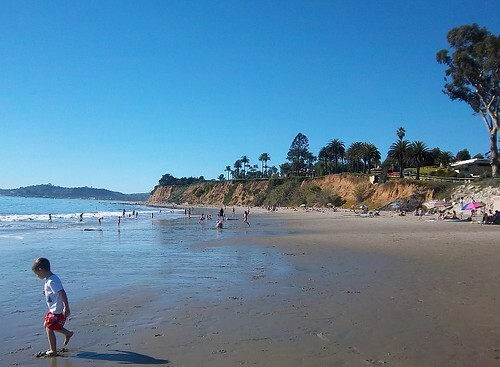 View their current "State of the Beach" reports, tide charts, educational videos, as well as their strategic plan and annual reports. 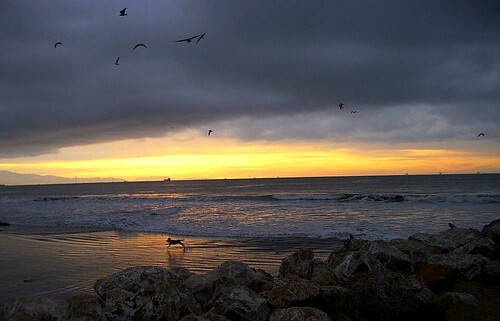 If you live in Santa Barbara County, visit the site of our very own Santa Barbara Chapter of the Surfrider Foundation. The Savoy Cafe is a true locals' treasure. Owners Paul and Kathy, both Santa Barbara natives, have created a comfortable, casual, chic little cafe right downtown, on Figueroa Street, just half a block from State Street. Whether you dine inside the cafe and people-watch from tables by the window, or eat in their lovely little patio area out back, you are sure to enjoy your meal, prepared from lots of fresh, organic ingredients. They open at 9:00am, Monday through Saturday. Breakfast includes fresh Eggs Benedict for about $12, breakfast burritos, a citrus-french toast and other morning treats, while for lunch or dinner, you can order sandwiches and soups, or build an organic salad, creating your meal with any of the 40 organic ingredients that are offered daily. In addition to their breakfast, lunch, and dinner menus, you'll find specially-prepared items in their hot case , like, wild Salmon with Pineapple Salsa, Pasilla Turkey Cakes, Teriyaki Tofu, Beef Stroganoff, and a delicious list of sides, as well. Side dishes include grilled organic vegetables, rice, mashed potatoes, squash gratin, macaroni and cheese. And their desserts? Well, they are truly fresh, home-baked, and inspired. You'll find traditional items, like chocolate chip cookies, carrot cake and lemon bars. But be prepared for the unusual: lavendar cupcakes, pomegranate cupcakes, Savoy brownies with mocha ganache, lemon-blueberry bread, Cakes, cookies, muffins, dessert bars, and other sweet treats are made fresh daily, with organic eggs and flour, real butter, and other natural ingredients which may include organic agave, honey, or pure maple syrup in place of refined sugar. 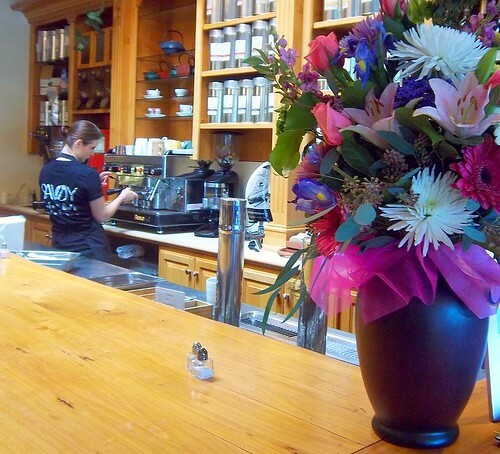 They also make a variety of gluten-free, dairy-free, vegetarian or vegan selections. 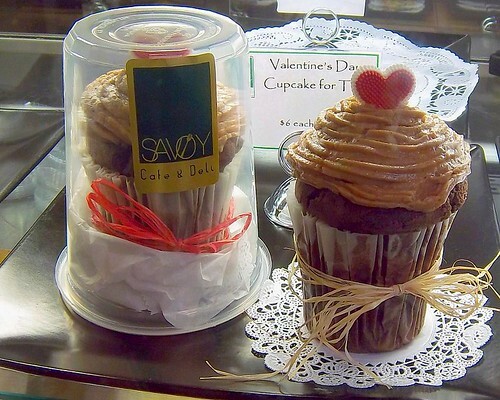 The Savoy Cafe also offers catering services. They love special requests, so if you're dreaming of a healthful, nutritious, delicious menu for a special event, give them a call - they'd love to discuss it with you. But don't wait for an occasion. 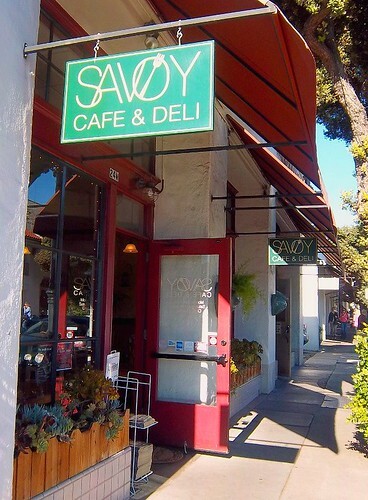 Be spontaneous - stop by the Savoy Cafe and Deli to enjoy a cup of specialty tea and a bakery treat, or to create the salad of your dreams, or dine on cuisine that is made from fresh and organic ingredients, created with a distinctly Santa Barbara flair. You will be delighted. Open until 7pm Monday through Saturday.